When it comes to watching HD and 4K content in the home, film fans typically have two options: physical media like Blu-ray and Ultra HD Blu-ray disc or digital streaming services like Netflix, Amazon, and VUDU. And they both have their notable strengths and weaknesses. On the one hand, streaming services provide extra convenience, transmitting titles directly into a user's home without any trips to the store. On the other hand, current streaming technology usually results in pesky buffering times, intermittent compression artifacts, inconsistent video quality, and lossy audio mixes. Conversely, physical media offers higher bitrates with superior video quality and stability, along with lossless audio. But, customers still have to go out and buy discs or wait for them to be delivered. And, once a buyer does finally get their movie in hand, they then have to find room for it on an increasingly crowded shelf. And then wait for it to load. And then wait for all the FBI warnings to pass. And so on. While there are diehard fans and detractors of both options, it's clear that neither is quite perfect. But, what if a company could somehow combine the benefits of disc and internet platforms without their key drawbacks? That's where the Kaleidescape Strato Movie Player comes in. Designed to mix the convenience of digital downloading with the quality of a disc format, Kaleidescape aims to deliver the best of both worlds. Instead of streaming content, the Strato Player actually downloads complete digital files from the Kaleidescape Store to the device's local storage. This allows customers to buy, download, and play full HD Blu-ray and 4K HDR Blu-ray quality titles with lossless audio (up to 24.5Mbit/s) and high bitrate video (up to 100Mbit/s) without ever leaving the comfort of their couch. Take that eject button! The Strato Movie Player features a simple but attractive aesthetic with a silver brushed aluminum body and a glossy black front panel marked by the Kaleidescape logo (which illuminates when powered on). The unit measures 17.0in × 3.1in × 10.0in and weighs in at 13.7lb giving it some solid heft. Though pretty similar to other rectangular set-top boxes, the design has a clear premium quality to its build, helping to separate the device from more run-of-the-mill streaming products and Blu-ray players. Meanwhile, the back of the unit houses a 100Base-TX/1000Base-T Ethernet port (RJ45 connector), an HDMI 2.0a output, an HDMI 1.4 output for dedicated audio, digital toslink output, and coaxial RCA output. Likewise, the system features integrated 802.11ac Wi-Fi connectivity. A handy backlit remote is also included with standard navigation options, and my review unit also came complete with an HDMI cable, power cable, and Ethernet cable. For review purposes, I evaluated a 6TB Strato Movie Player. Throughout the course of my testing, I connected the device to a Samsung KU6300 4K Ultra HD TV and a 2017 VIZIO E-Series 4K Display via an Onkyo TX-NR555 AV Receiver. For general playback, setup is actually quite simple, though more advanced users can take the time to fine-tune the player's output to their liking. Customers simply need to plug the HDMI connection to their display or receiver, connect the unit's power cable, and then turn on the system. Booting the system from standby can take a few seconds but the load time is never problematic. Once on, the player establishes default output settings based on your display. My unit came pre-activated and linked to a Kaleidescape account, but new users might have to do this manually through the settings menu. The on-screen menu also offers options for time zones, screensaver timeout, standby mode preferences, Wi-Fi, Network, player name, languages/subtitles, passcodes, parental control, and more advanced features for calibrating touch panel devices and automatic projector screen masking triggers meant for users with fancy integrated home theaters. Other triggers or event cues designed to work in tandem with home automation control systems include the ability to dim a user's lights when a movie begins and then have the lights automatically come on gradually when the end credits roll. In order to actually access more detailed video and audio preferences, however, users will need to navigate to the system's browser interface using a separate laptop or desktop computer connected to the same network as the player. Though not having these settings integrated into the player's own on-screen UI is an inconvenience, the browser interface itself has a plethora of output settings, allowing users to fine-tune practically every aspect of the device's video and audio playback. This includes a very handy HDMI capability and status test, which provides a detailed rundown of the source video signal's attributes (resolution, color gamut, frame rate, dynamic range, chroma, etc.) and how they are actually being received by your TV. For OCD AV enthusiasts like myself, who always want to ensure that content is being displayed at full quality and as close to the native source as possible, these options and stats are a dream come true. With settings out of the way, users can then navigate to the player's movie library. The review unit I received came pre-loaded with 78 movies, including a mix of HD, 4K SDR, and 4K HDR titles (though buyers will have to download all their own titles). Users can choose to display the library as a simple list ordered alphabetically by title, director, year, runtime, rating, or quality. Likewise, users can also opt to view titles as a beautiful collage of cover art images. Either way, the interface is visually appealing and perfectly functional, offering a terrific user experience that allows customers to sort their content exaclty how they want. 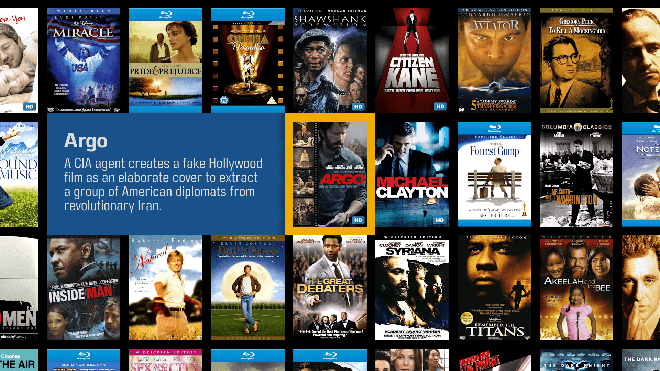 After selecting a movie from the menu, the system takes users to a more detailed title page with larger cover art, a synopsis, cast & crew info, and options to watch supplements (if the title has them) or select specially chosen scenes. Different from the standard chapter stops also included, these memorable scenes (or songs for musicals) are handily curated by Kaleidescape, and users can also time stamp their own additions as well. Functions during actual playback are all pretty standard, with the ability to skip chapters, play, pause, rewind, and fast forward. Pressing the info button on the remote will display the time left in the movie, along with access to audio track options, scenes, extras, and chapters. As with the advanced AV settings, access to the Kaleidescape Movie Store is not actually integrated into the Strato Player's own interface. 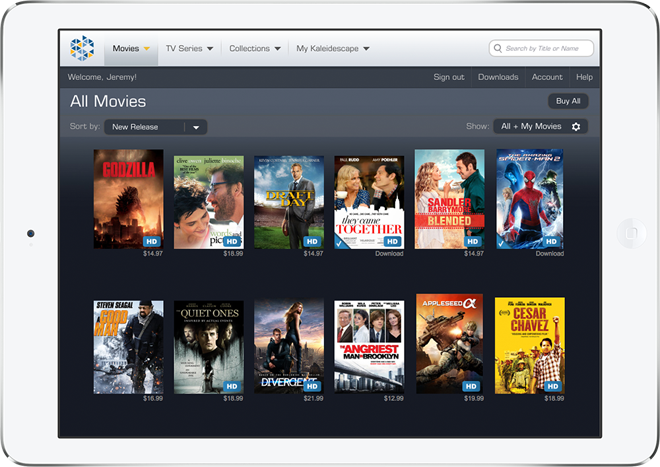 Instead, users will need to head to the Kaleidescape Movie Store website on a computer (or presumably via an integrated system touchpad or the Kaleidescape iPad app). Once there, users can buy titles and initiate downloads directly to their systems. Typical HD movie sizes with lossless audio come in at around 30GB, and typical Ultra HD HDR movie sizes with lossless audio come in at around 60GB. I have a 100 Mbps internet connection and I would typically get download speeds of about 45 Mbps from the Kaleidescape server via Ethernet. This resulted in about a 4 hour download time for the 4K HDR titles I added and about 2 hours for the HD titles I added. Downloading is best done with the player in its low power standby mode as speeds are dramatically reduced when the system is in use. I typically initiated downloads before going out for a few hours or going to sleep, leaving my new movie titles waiting for me the next time I booted the system up. Though far from the nearly instant playback of most streaming services, the tradeoff in wait time is pretty reasonable considering the upgrade in quality. With that said, customers with slower internet connections or strict ISP bandwidth throttling might think differently. 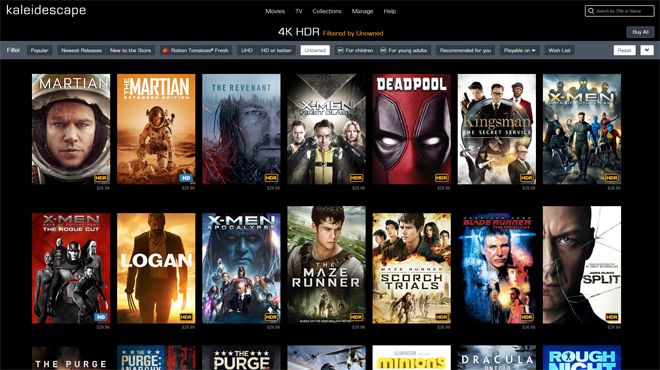 With a license agreement between 22 of the top 25 main movie distributors in the US, the store itself offers a growing collection of full disc quality titles for purchase (there is no rental option), including about 150 4K films with HDR10 support (unfortunately, Dolby Vision is not currently offered, but that will likely change when future players are released). Likewise, select titles include lossless Dolby Atmos or DTS:X soundtracks. With that said, different quality versions of the same movie will sometimes only include certain audio formats. For instance, the SDR 4K version of Leon includes the Dolby Atmos soundtrack, but for some reason, the HDR 4K version only has the DTS-HD MA track. Similarly, the 4K HDR version of Fate of the Furious only has a DTS-HD MA track while the HD version includes the DTS:X track. Thankfully, the majority of 4K HDR titles that have Atmos audio on their corresponding Blu-rays also have them here. Finally, some movies also feature the same supplements found on their Blu-ray releases. HD titles are available from major studios like Disney, Sony, Fox, Warner Bros., Lionsgate, and Universal, along with smaller labels like Kino, Orchard Films, Magnolia, Cinedigm, and more. In addition, 20th Century Fox, Sony, Warner Bros., and Universal all offer 4K HDR titles as well. Prices range from around $16 for some HD titles to as much as $37 for new 4K HDR titles. And as a nice added bonus, the store also features UltraViolet support for select movies, allowing customers to link their UltraViolet account to their Kaleidescape account. I tested this feature out myself and was able to download HD digital titles I already owned in my UltraViolet library, like Argo, at no extra cost in full Blu-ray quality on the Strato player. I was also given a discounted price to upgrade to the 4K HDR version if I wanted to. And if you have previously purchased 4K HDR UltraViolet titles or codes you should be able to redeem them for full quality HDR Kaleidescape downloads as well. In addition, compatible titles purchased through the Kaleidescape store also come with UltraViolet copies playable on other services like VUDU. With that said, at this time, it appears that Disney and 20th Century Fox do not support UltraViolet via Kaleidescape. To test out the player, I watched several 4K HDR10 titles downloaded to the Strato, including movies like Wonder Woman, The Fate of the Furious, The Man from U.N.C.L.E., Kong: Skull Island, Passengers, The Amazing Spider-Man 2, Pacific Rim, Fantastic Beasts, Batman v Superman, and Billy Lynn's Long Halftime Walk. Likewise, I also sampled a few 4K SDR like Taxi Driver and Lawrence of Arabia, and standard HD titles like The Avengers and Rogue One upscaled to 4K using the player's internal scaler. In general, playback quality was exactly as advertised, offering an experience on par with Ultra HD Blu-ray and Blu-ray disc releases -- free from the buffering, compression, and other inconsistencies that one finds on a streaming service. Likewise, there were no pesky ads or trailers to skip through here. After pressing OK and about a five-second delay, movies would simply play at full quality with no major issues. Highlights were bright, blacks were deep, and colors were sumptuous on many of the HDR10 titles, rendering all of the hyper-saturated hues of Havana in the Fate of the Furious and all of the tropical primaries of Themyscira in Wonder Woman. The Man From U.N.C.L.E., a title not yet available on Ultra HD Blu-ray disc, was also especially impressive with life-like depth in several gorgeous scenes set in the film's European locations. And Billy Lynn's Long Halftime Walk even played at 60 frames per second just like the Ultra HD disc. While the 4K titles were all essentially immaculate, I noticed some isolated transfer-related banding here and there on some of the HD downloads. This is to be expected, though, since some Blu-ray transfers have those artifacts, it's only natural for some of the digital sources for the Kaleidescape files to have similar imperfections. On the audio front, bitstreamed lossless playback of DTS:X and Dolby Atmos soundtracks came through without any major problems. With that said, there was about a 2-second dropout in the audio whenever I would resume a title after pausing or fast-forwarding/rewinding -- but this could have more to do with my receiver than the player itself. Outside of normal viewing, I also did several head-to-head comparisons between Kaleidescape downloads and other formats, pitting the Strato player against Ultra HD Blu-rays and Blu-rays via an LG UP970, and services like Netflix, VUDU, and HBO Go via a Roku 3. When switching back and forth between the Ultra HD Blu-ray version of Fantastic Beasts and the Kaleidescape 4K HDR version, the picture revealed itself to be essentially identical. There was perhaps a slightly redder tinge to the Kaleidescape version (possibly attributable to tiny differences in how the two players output video), but as far as I could tell, clarity, contrast, HDR performance, and overall stability were exactly the same, with neither format revealing any notable quality issues. Comparing actual Blu-ray discs to their Kaleidescape HD counterparts yielded similar results. The Avengers disc looked identical to the Strato download with no issues to report. Meanwhile, the very opening fade-in transition of Guardians of the Galaxy looked just a hair brighter on the Kaleidescape with a fleeting instance of posterization, but after that, both versions looked identical. 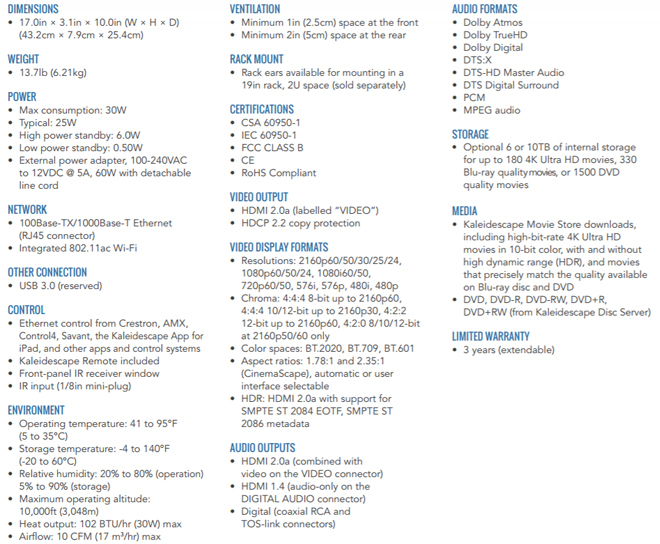 I also examined a few SDR 4K Kaleidescape downloads against their standard Blu-ray versions. And though the upgrade was not as dramatic without the benefits of HDR, the 4K SDR Kaleidescape versions of Taxi Driver, Lawrence of Arabia, and On the Waterfront were all superior to the Blu-rays, offering slightly better clarity. On the Waterfront featured a particularly visible improvement, revealing a finer and even more film-like grain structure with sharper textures compared to the already beautiful Criterion Blu-ray release. When set against traditional streaming services, the Strato player really shined. Transitioning between the Netflix HD and Kaleidescape HD versions of Rogue One and The Jungle Book revealed notable differences. The Netflix versions typically started out at low resolutions before buffering to HD, and though quite nice looking once they hit 1080p, the streams still revealed occasional compression artifacts and soft textures, especially during fast-moving scenes. In contrast, the Kaleidescape versions immediately started at full HD quality with sharper detail and no compression issues. Instead, they looked just like actual Blu-rays. Pitting the HD HBO Go version of Batman v Superman against the 4K HDR Kaleidescape version was even more telling, with the HBO Go title clearly suffering from a lower bitrate and a comparatively dull, washed out image. Likewise, the HBO version was not in the original aspect ratio and was instead cropped to 16:9. Comparing the VUDU HD stream of Argo to the Kaleidescape HD stream yielded similarly predictable results. The VUDU was solid but couldn't seem to buffer beyond 720p, revealing some minor noise, blocking, and softness. Meanwhile, the Kaleidescape was just as sharp and stable as the actual Blu-ray. Unfortunately, I don't have a display capable of comparing a VUDU Dolby Vision title to a Kaleidescape 4K HDR version, but I suspect the differences would be the same as those between VUDU 4K and 4K Blu-ray. Finally, it should be noted that the Strato almost always offered lossless audio options while all of the streaming services only provided inferior lossy mixes. In short, the player performed exactly how it was supposed to, providing full quality 4K HDR and HD downloads that equaled their disc counterparts and bested their streaming competition. 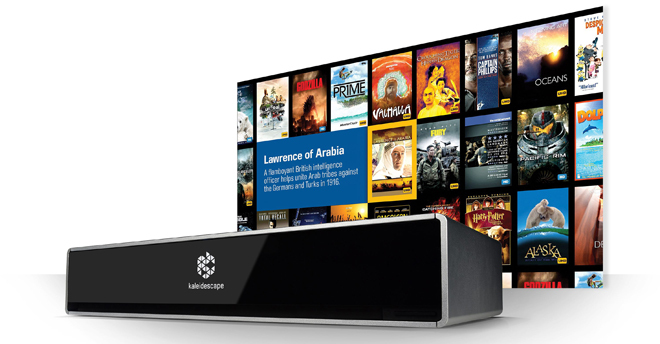 Fully living up to the promise of mixing highlights of physical media and digital streaming, the Kaleidescape Strato Player really is one of the best ways to watch a movie at home. That is, if you can afford it. At $4,495 for the 6TB player and as much as $37 per 4K HDR movie, this is not a mass-market product. 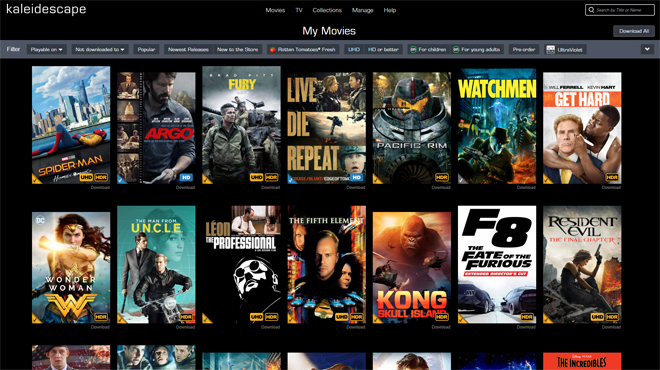 Of course, Kaleidescape itself has made it clear that this isn't a platform designed for mainstream users. This is a media player for big AV enthusiasts with home integration systems looking for a better movie-watching experience. And while it might be too pricey for some, the device really does offer the quality, convenience, and advanced set of features to earn its premium status. There is still just a little room for improvement (Dolby Vision and HDR titles from more studios, please), but if you're someone who wants the simplicity of digital downloading without sacrificing the quality of a disc format, the Strato Movie Player is exactly what you've been looking for. Though not available direct to consumer, interested customers can purchase a system through the custom install market. Click here to find a dealer near you. Recommended.